After 14 years as first violinist of the Tokyo String Quartet, Peter Oundjian started losing control of two fingers of one hand. He was eventually forced to put down his bow because of what was eventually diagnosed as focal dystonia, a neurological disorder causing muscles to contract or spasm involuntarily. He did, however, pick up the baton—and next season starts as the music director of the Royal Scottish National Orchestra, following a similar stint with the Toronto Symphony. His dynamic personality and radiant optimism have helped him deal with what he calls the “fascinating and baffling condition” of focal dystonia. Today, he is even starting to play the violin again—very gradually. Here is his story. Musical America: When did you first notice something was wrong? What were your earliest symptoms? Peter Oundjian: From the early 1980s, something in my shoulder seemed to be seizing up, and I had to cancel concerts occasionally. Then, seven years later I noticed my ring finger seemed to be lingering behind, losing its independence. Eventually, I realized I couldn’t vibrate without lowering my ring and pinky fingers completely. MA: Did you know what was wrong? my ring and pinky fingers when nothing was actually wrong with them. I had lots of tests, and results showed those digits were not compromised. Then someone recommended I visit the Miller Healthcare Institute for Performing Artists in Manhattan. It was there, in 1994, that I first heard the word “dystonia.” It’s an uncontrolled motion that occurs only in a specific situation. MA: Did having a diagnosis help? Oundjian: Not really. In those days there was not much information about dystonia—pianists Leon Fleisher and Gary Graffman both had been struggling with dystonia for years, but didn’t have much to say to me in the way of advice. MA: What did you do? Oundjian: It was not the most positive moment of my life. By the end of 1994 I knew it was unlikely that my violin playing was going to come back to where I’d want to play quartets or—God forbid—recitals. MA: Is this when you had the surgery? Oundjian: That was in 1996. It had been suggested that the ulnar nerve in my left arm might be impinged, and so I had an operation in which that nerve was moved up an inch and no longer goes through my funny bone. It had little effect except to make me less amusing on my left side [he smiles]. Oundjian: Not at the time. I soon began to feel that the medical profession really didn’t know how to help me. Now I think my problem had more to do with a kind of “bullying” of the index and middle fingers, a kind of grasping without total control. MA: How did you know to turn to conducting? 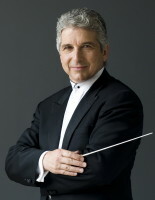 Oundjian: As a kid I had always jumped at the chance to conduct a brass group or a choir. At Juilliard I was a violin major, but I took a minor in conducting. In 1976 Herbert von Karajan came to Juilliard to give master classes. I was concertmaster of the orchestra, and he made me stand up and conduct Brahms’s First Symphony while he went out in the hall to check balance. He was very encouraging of my ability to become a conductor. MA: You’ve mentioned André Previn was a supporter. Oundjian: He was a great friend and wonderful advisor and was keen that I start to conduct. It was he who gave me a boost by inviting me to share the podium with him at Caramoor’s 50th-anniversary concert, in 1994. Then Frank Solomon put me on his roster, and he has been a great mentor and manager. MA: How are you dealing with focal dystonia now? Oundjian: I recently found an extraordinary doctor, Steven Frucht. He was a pre-college violin student at Juilliard, went on to Harvard, and became a neurologist. He’s now Director of Movement Disorders at Mount Sinai Hospital in New York City. I went to see him because I’ve been practicing violin for the last few months. MA: That’s great news! What prompted you to pick it up again? Oundjian: This being the 90th anniversary of the Toronto Symphony, I decided that I would play the Bach Double Violin Concerto with my teacher and friend, Itzhak Perlman. I knew that if I was going to have one more try at the fiddle, I was going to have to have a major concert in front of me because I’m far too busy to practice without being forced to. Oundjian: In a recent conversation, Itzhak gave me the most extraordinary insight: “So when you pick up the violin, you’re waiting for this thing to happen, and it never lets you down.” Itzhak suggested that I’ll never heal myself while I fight it. MA: In other words, mind over matter. 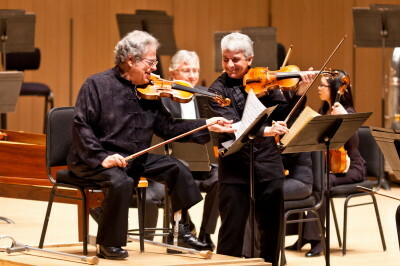 TSO Music Director Peter Oundjian and violinist Itzhak Perlman perform Bach’s Concerto for Two Violins with the TSO on Sat, April 28, 2012. Photo: Dale Wilcox. MA: Do you have any advice for colleagues that might be dealing with injury or movement disorders? Eugenia Zukerman, flutist, is also a writer, arts administrator, TV journalist, educator, and Internet entrepreneur ( ClassicalGenie.com). In demand worldwide as a soloist with orchestras, as a recitalist, and as a chamber-music player, she has recorded more than 20 CDs. As a writer, she has published two novels and two non-fiction books, and from 1998 to 2010 she was the artistic director of the Vail Valley Music Festival in Vail, Colorado. In the summer of 2011 she performed at the Verbier Festival in Switzerland, where she also created Eugenia Zukerman’s Verbier Vlog for MusicalAmerica.com.